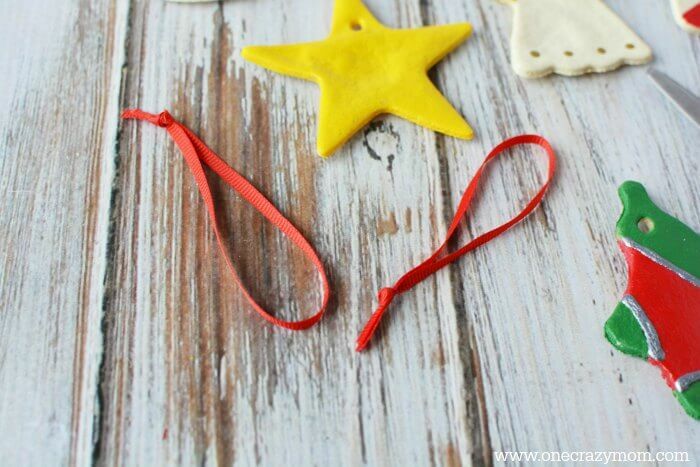 Salt Dough Ornaments are so easy to make and super fun for kids. They also provide lasting memories that you can cherish for years to come. 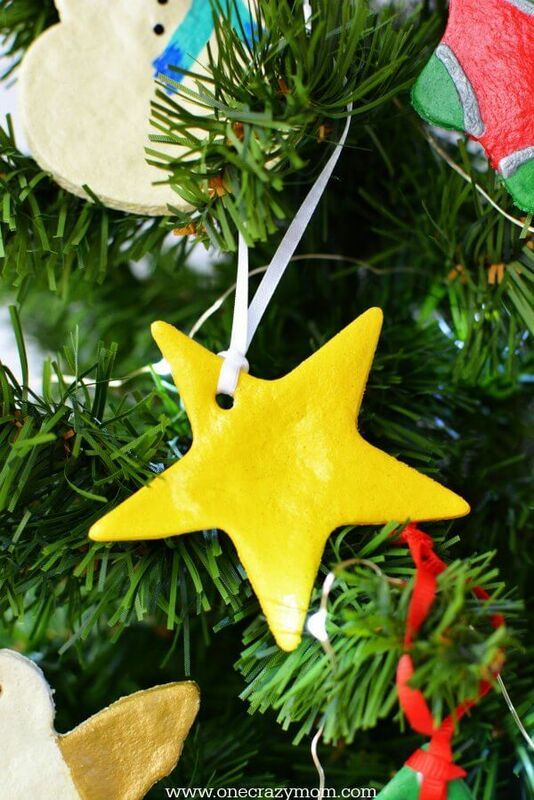 Learn how to make salt dough ornaments for the perfect afternoon craft activity. I love making these special ornaments every year with the kids. We have some really awesome memories making these year after year. Plus, I just love seeing the ornaments we made together on the tree! Once you learn how to make salt dough ornaments, you will wonder why you didn’t start sooner. 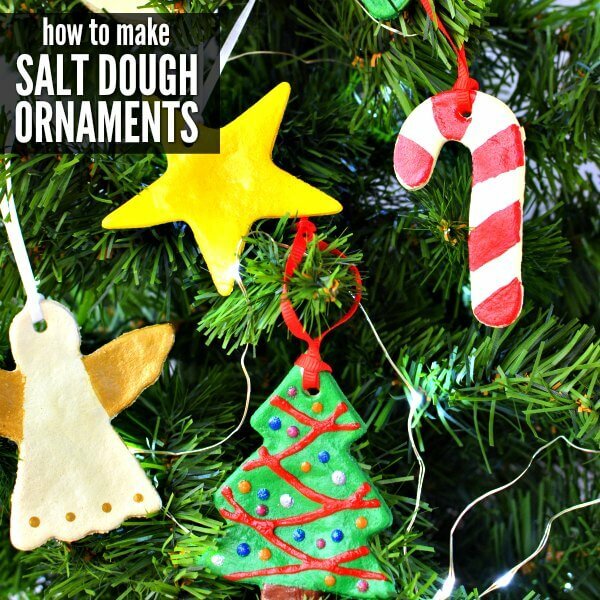 How do you make salt dough Christmas ornaments? They are so simple and really fun! You only need a few supplies to make these. It is the perfect activity for children to help with. Sometimes the dough can shift when you place your masterpiece on the baking sheet. I like to cut the hole in the ornament after I have already moved it onto the baking sheet. This prevents the hole from becoming skewed if the dough does shift slightly. It also helps if you have a really good baking sheet. I actually just had to replace several of mine. My favorite part is decorating each ornament. You get to see the creativity of your children and how each ornament is so unique. It is a great chance to see their creativity shine. Make sure to have a good variety of acrylic paint on hand. I like to get several Christmas colors- red, green and some accent colors such as white and gold. You can order a nice assortment here. Kid’s always love puffy paint so that is fun to use as well. 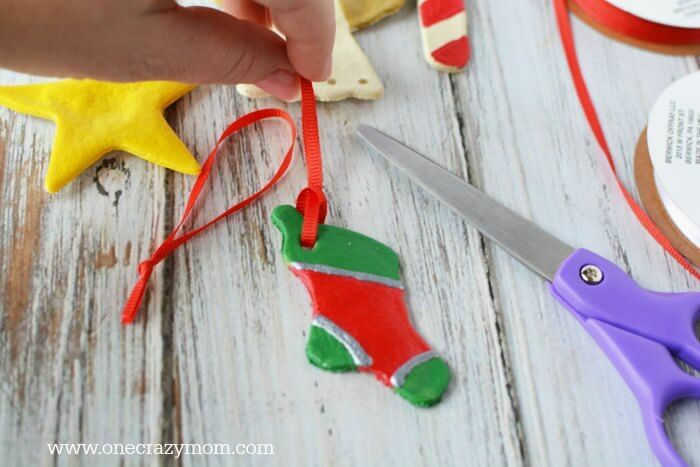 Make sure you have a cookie cutter for each child to make their ornament. I like to have an assortment of cookie cutters to choose from. What about Salt Dough Handprint Ornaments? 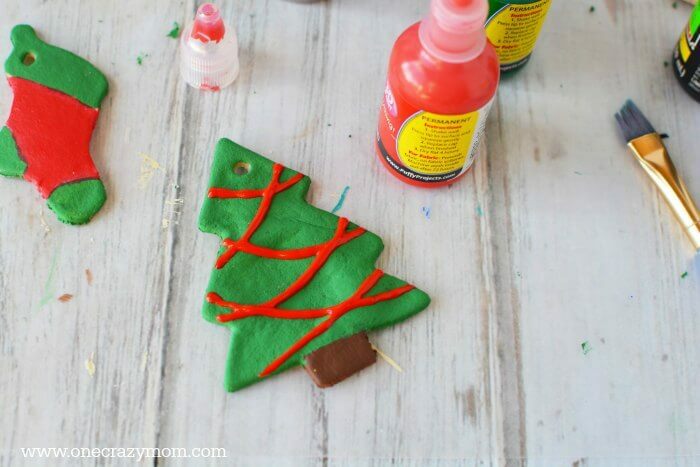 Another fun idea is to make hand print ornaments. This is especially cute with little ones and a great keepsake over the years. 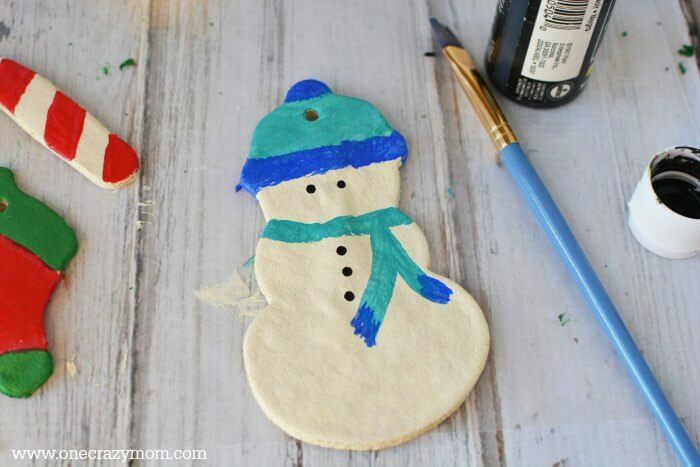 How do you make salt dough handprint ornaments? Simply press their little hand into the ornament and bake. You can decorate with glitter, paint or whatever you prefer. Now to protect these ornaments and keep them for years to come, it’s important to spray them with a clear spray paint that will seal them. 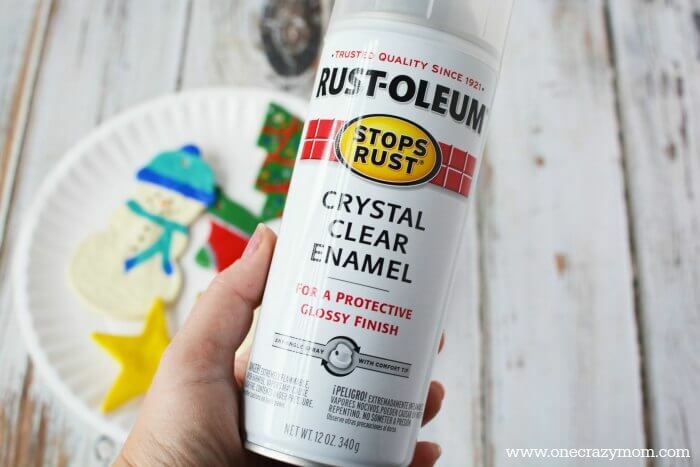 You can use any brand you like but I have had good success with Rust-Oleum Crystal Clear Enamel. This step is SO important so please do not skip it. Protecting these sweet ornaments will mean many years of hanging them on the Christmas tree. Once you know how to seal salt dough crafts, they can last for years and years! They truly can be passed down if sealed property because they will last! These ornaments will be so special hanging on the Christmas tree. If you like more of a shiny ornament, choose a gloss finish for the enamel spray. 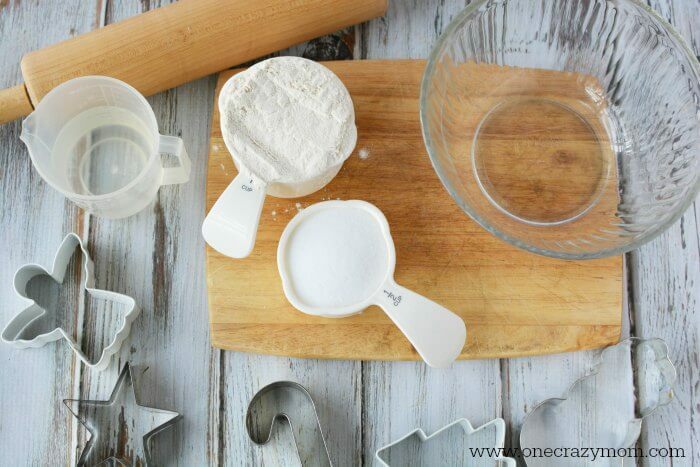 Let’s get started making Salt and Flour ornaments. Once you learn how to make homemade salt dough ornaments, it will become such a fun annual tradition. 1. Line a baking sheet with aluminum foil. Set aside. 2. 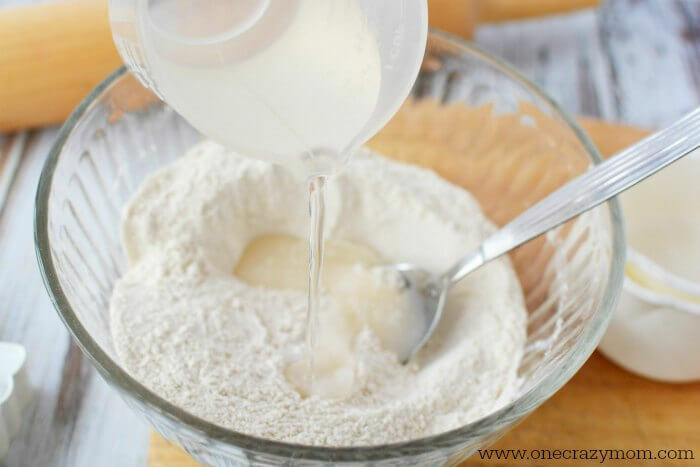 Mix flour and salt together in a bowl. Add water and stir until a dough forms. 3. On a lightly floured surface knead the dough for at least five minutes, continuing to add flour as needed to prevent the dough from sticking. This step is important. 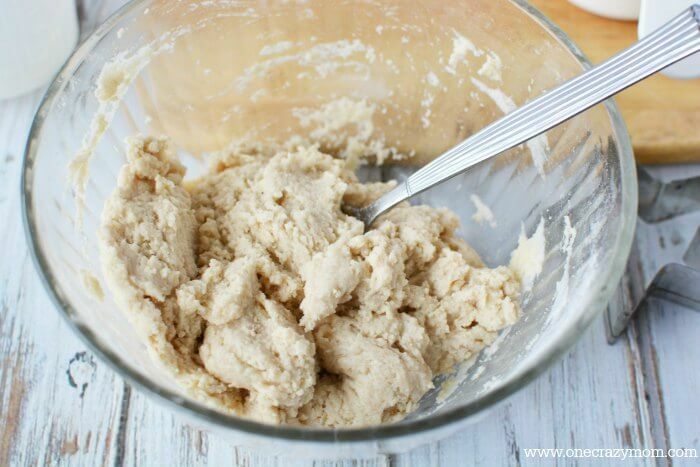 If you skip this step you’ll end up with very sticky dough and it won’t cut into shapes well. 4. 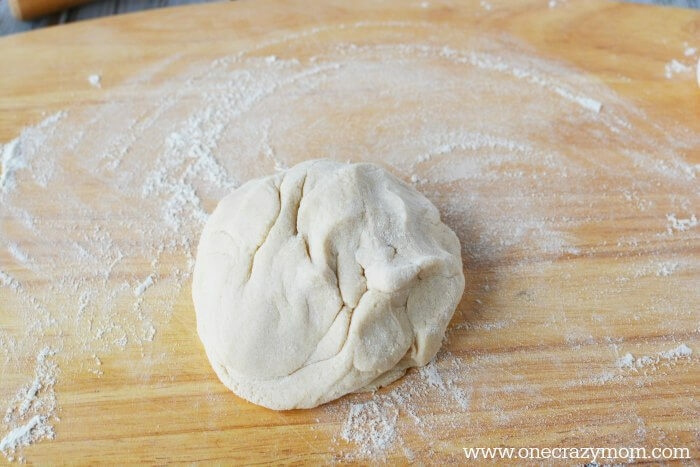 Once dough is ready, roll out the dough onto a lightly floured surface in 1/4″ thickness. 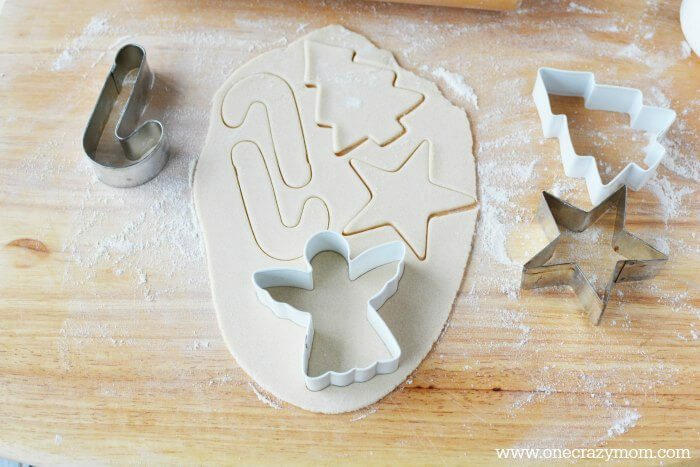 Use cookie cutters to make various shapes. 5. 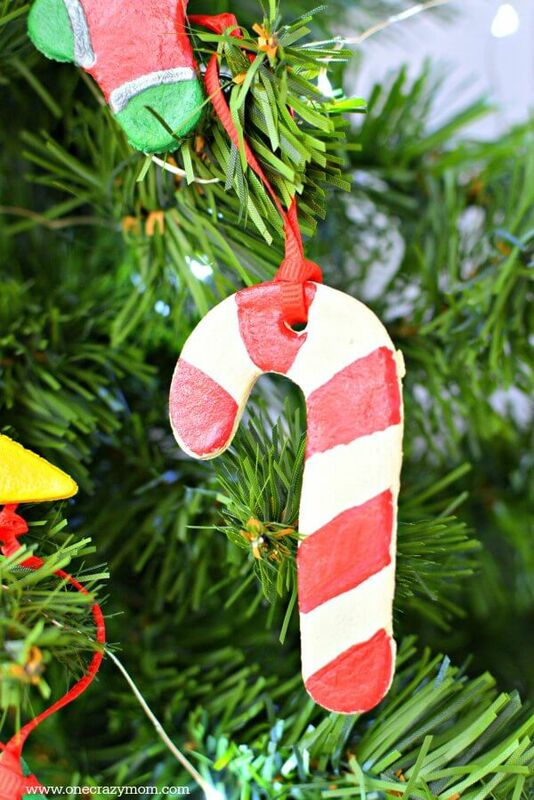 Use a drinking straw to create a hole in the top of each ornament. 6. Place onto prepared cookie sheets and preheat oven at 225 degree until dry (or 200 degrees depending on oven), turning every 30 minutes. Once dry, decorate as desired on parchment paper. 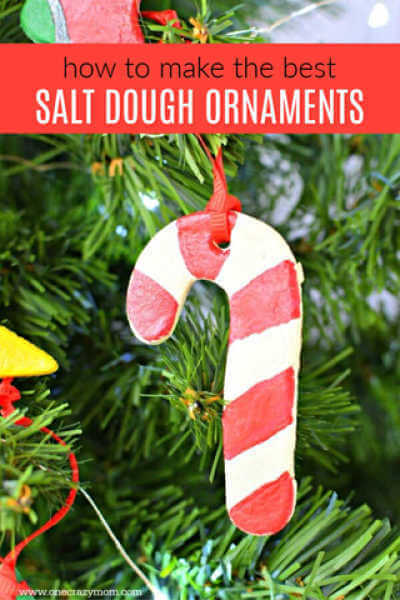 This Salt Dough Ornament recipe is SO easy! There are so many great ideas for your Christmas tree. These dough ornaments are so fun to make. Once you make the salt dough recipe, it’s time to decorate each one! 1. Using acrylic paints, paint each ornament as desired. 2. Add additional details with puffy paint if desired. Let dry completely. 3. Coat each ornament with clear spray to seal it, letting dry completely. Be sure to seal the front and back of the ornaments. 4. Cut a piece of ribbon and tie one end. Place the lopped end into the hole of the ornament and bring the tied end through the loop, creating a slip knot to hang. We love Salt Dough Recipes! They are so simple and turn out gorgeous! 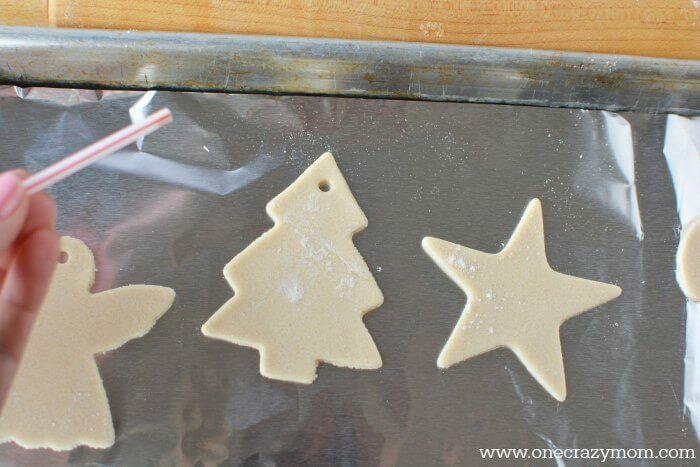 We prefer this method of baking the ornaments but some people also like making salt dough ornaments microwave version or even the no bake salt dough ornaments version. Let us know yours turn out. 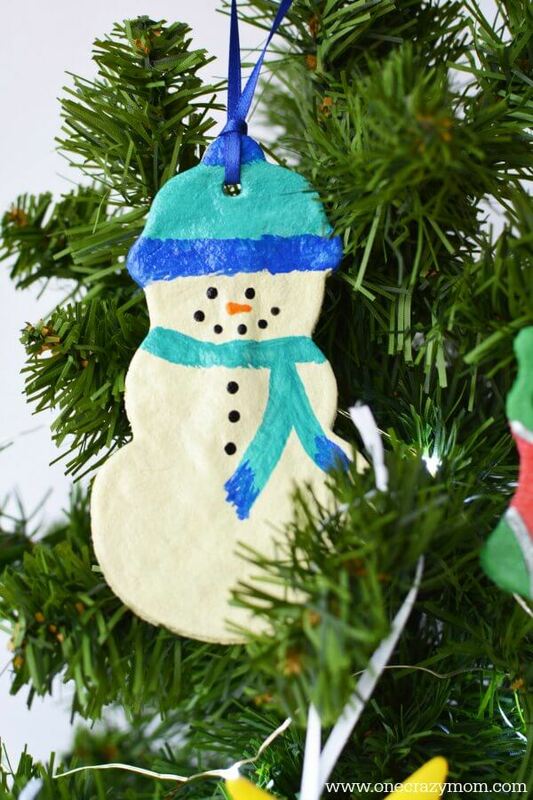 Let us know how your Salt Dough Ornaments Turn out! You will have such special memories with the entire family. There is something so special about a craft that is not only fun but you can cherish for years to come. We actually made several of these last year to hand out as gifts. A few ideas include: grandparents, aunts, uncles, teachers, friends and more! 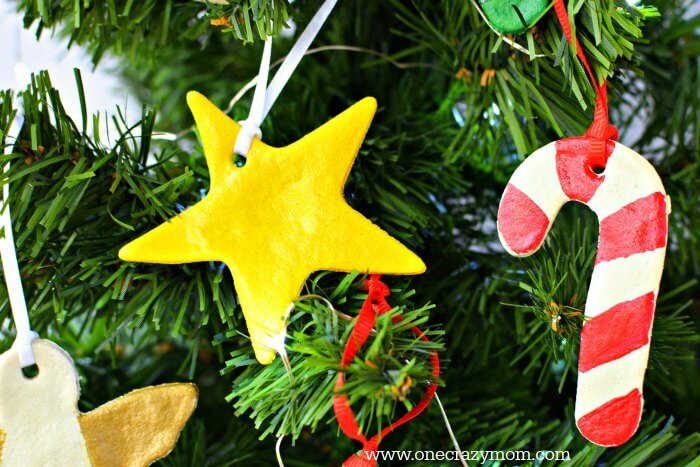 Make a list and start making your ornaments today. 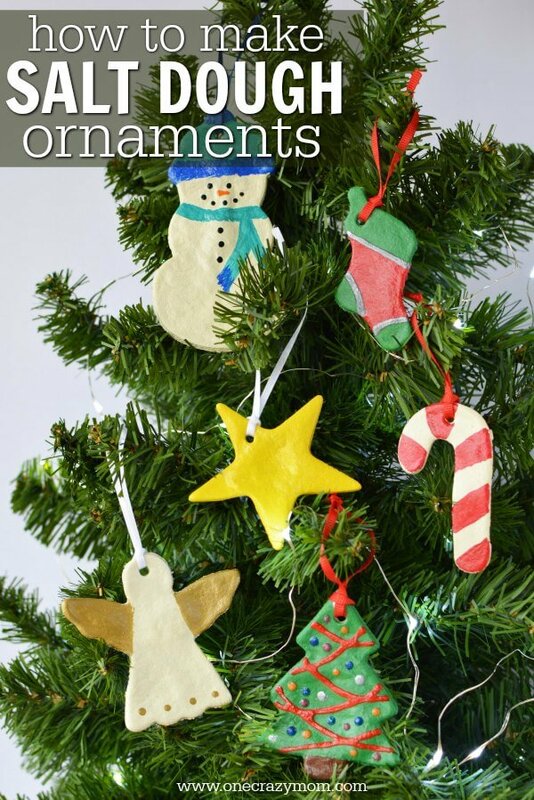 Let us know what fun ideas you have for your ornaments and how they turn out. 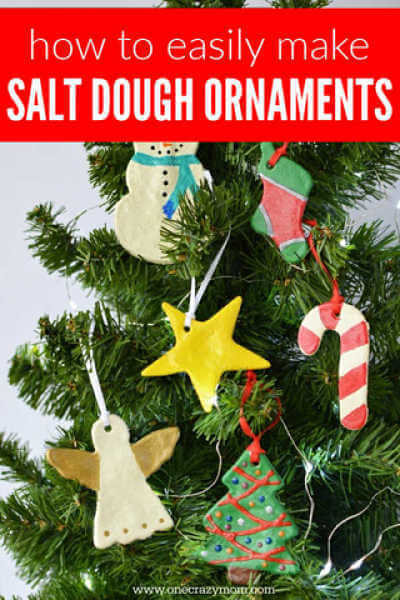 It is going to be a blast making salt dough ornaments! Learn how to make a string ornament that is simple but gorgeous with this easy tutorial. Approximately how long does it take to bake the ornaments?